Shahid Afridi, though not new to controversy, turned into a bête noire recently when a video went viral of him suggesting that Pakistan doesn’t want Indian-occupied Kashmir (IoK) since it can’t even manage its own four provinces. He said that IoK should also not go to India and should rather be an independent entity. He further added that its occupation should end since it’s resulting in the loss of countless innocent lives. This statement, however, landed him in hot waters since many Pakistanis took offence. There was uproar on social media as well as mainstream media over his statement. However, it was nothing compared to the death threats, treason charges and lynch mobs Afridi would have faced had he been an Indian cricketer or some famous Indian personality guilty of the same in India. But it was enough for him to be lambasted by critics, forcing him to issue a clarification amidst a Twitterstorm. But no matter how mild or how constricted that criticism was, the question is whether it was warranted? Let’s take a look at the facts here. Indian brutalities in IoK have only increased with the passage of time and the valley is rampant with human rights abuses. On one hand, there is the barbarity unleashed through pellet guns, while on the other there are enforced disappearances, on the spot killing of Kashmiris, and victims being branded terrorists. IoK saw a 166% rise in civilian casualties in 2017 and the 2018 numbers could be even higher. While Pakistani diplomats mull over strategies to take up the IoK issue, and the foreign office resorts to mere lip service, there are Kashmiris being killed even as I write these lines. If we are intent on pretending that the IoK issue would solve itself or there would be this grand, decisive war between Pakistan and India whereby we would free IoK, we are living in a fool’s paradise. Afridi’s points may not have been supported by hard evidences but we have to consider that he is a cricketer and not a seasoned politician or intellectual. Of course, it’s not that Pakistan doesn’t want IoK or that Kashmiris’ burial of their martyred draped in Pakistani flag hasn’t been driven by a desire to join Pakistan, but essentially Afridi is right. Pakistan is definitely facing innumerable challenges pertaining to national security, political instability and economic crisis, rendering it unable to exert significant pressure on India to cease its barbarities. 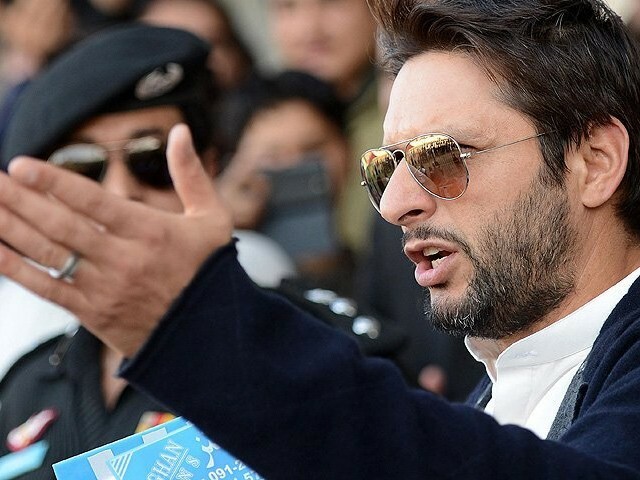 Perhaps Afridi’s emotions arose out of his deep grievance for the plight of Kashmiris, having become disillusioned with the lacklustre attitude of the Pakistani government in regards to the IoK issue. In the grand scheme of things, the kind of self-assessing criticism ensued by Afridi would only serve us right since it helps us look at our flaws and what we are doing wrong. Whether the solution is to call for an independent Kashmir, a referendum in accordance with the United Nations resolution or to urge Kashmiris to not fight against armed resistance, throw stones or protest, and accept their fate, we should pursue it vigorously. While it may be treacherous and imply that we have given up on Kashmiris, it would be the only feasible option if all else fails to save them. In any case, what we can’t do is carry on with the same casual attitude on a state level, practically doing nothing for the IoK issue and having the foreign office occasionally call out India for its crimes against Kashmiris. This is what Afridi may have been meaning to say all along. We didn’t like it because it is the hard truth but just as any other individual, Afridi is entitled to the right of an unfettered free speech. We may not exactly be the bastions of tolerance or peace, but Pakistan certainly fairs better than India when it comes to hateful rhetoric against the other one, wherein provocateurs like Arnab Goswami or Ajit Doval present arguments riddled with conspiracy theories and crude distortions of subjects. We don’t persecute or ‘go nuts’ when people say something favourable about India, call for better relations or say something that goes against the ‘national interest’ in that regard. Let’s keep it that way and not make life hell for Afridi for simply venting out his emotions with good intent. It would be too dangerous for us as a nation to dwell into the same bigoted madness as the one unleashed by the Hindutva fanaticism rife in India, and whose penchant for jingoism coupled with religious fanaticism has only resulted in a destabilised and terrorism induced India. Let’s not be like them. Exactly! Let the Kashmiris decide their future. Pakland can barely take care of it’s 4 provinces. Because other princely states joined Hindustan, by their own free will. wanted to. Because of geography. Maintaining a border with Hindustan, an army, a border police, immigration, etc.would be beyond the Nawab’s treasury. Not feasible. Besides, Hindustan would have annexed it anyway.